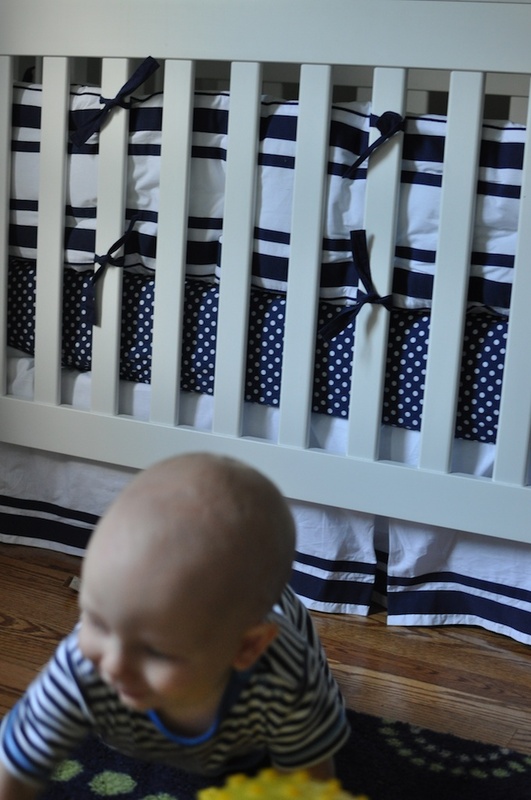 Choosing a crib bed set was really fun for me when I was waiting for David’s arrival. We didn’t know if he was a boy or girl, but there were still plenty of options. 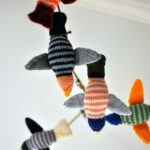 I used mostly navy blue in David’s nursery because 1) I was sure he was a boy 2) if I was wrong, I could add girly/pink/floral touches. I chose Pottery Barn’s Harper crib set (one of my most practical, frugal friends recommended PB’s crib sheets, and she was right. I’ve heard people complain about crib sheet issues, and ours have been great). 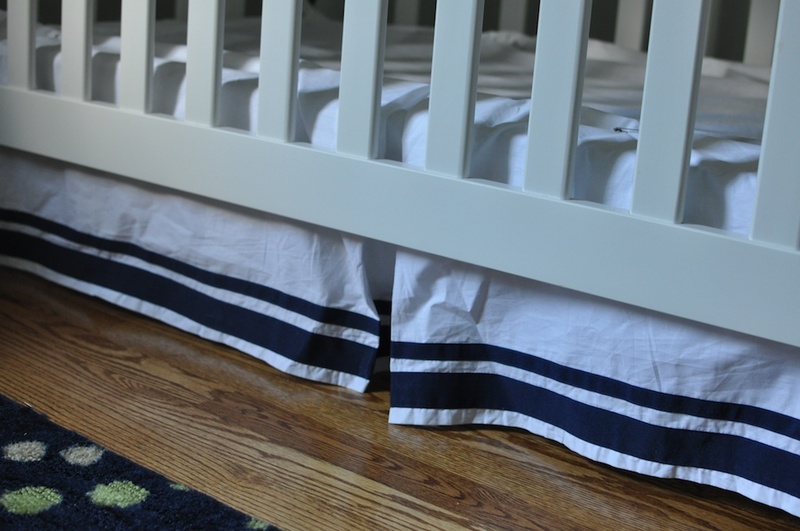 The only problem with the adorable set is, the instant you lower the crib, your crib skirt drags the ground and looks horrible. So most people just take it off, right? Then you pack it away when your kid is only like six months old. 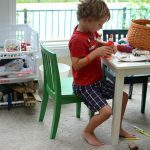 We use David’s crib for storage (our table leaf is under there), and since I loved my crib skirt and didn’t want to store it away, so I decided to shorten it — without sewing (which is easier and makes it re-usable). Here’s David’s crib with the crib lowered and the crib skirt dragging the ground. It looks so sloppy. This is back when David dragged himself around. A year later, he still has the same haircut. 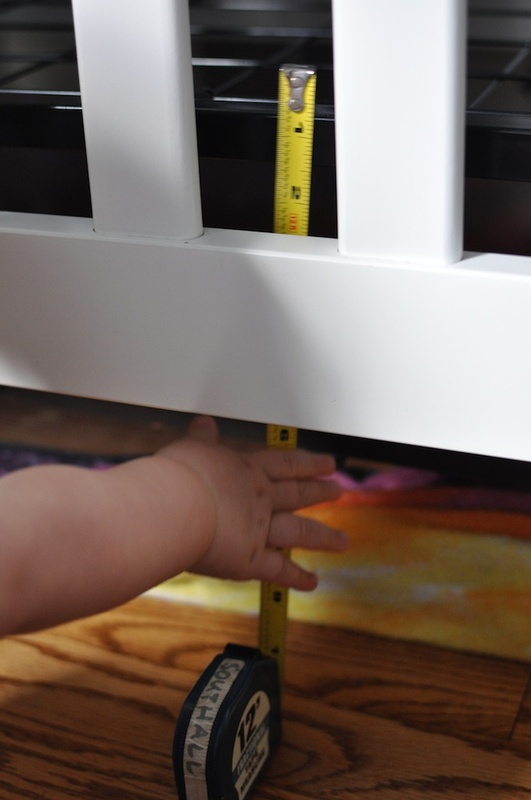 After lowering the mattress, the first step is to measure how much of a drop you need for your crib skirt needs; from the floor to the top of the mattress platform. I actually had a better photo, but it didn’t include a chubby hand, so I chose this one. Next, give your measuring tape to your baby and switch to a paper measuring tape that isn’t as appealing. 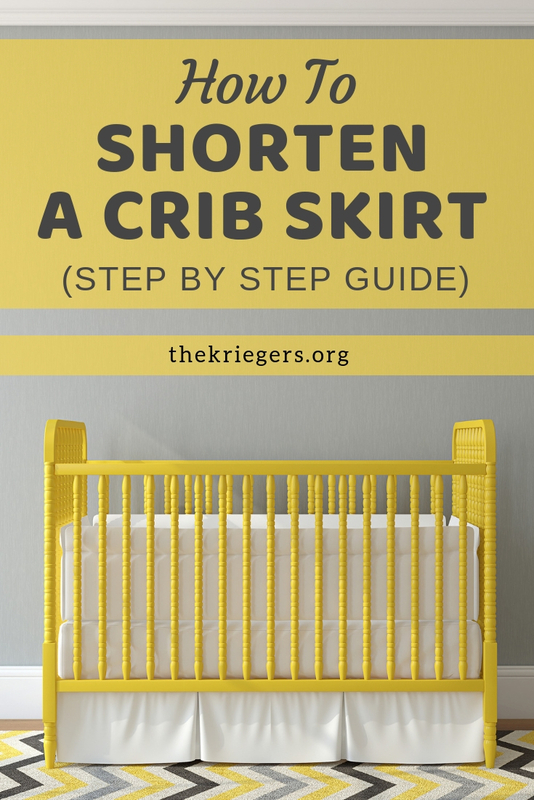 Take the crib skirt off the crib and lay it flat on the floor. 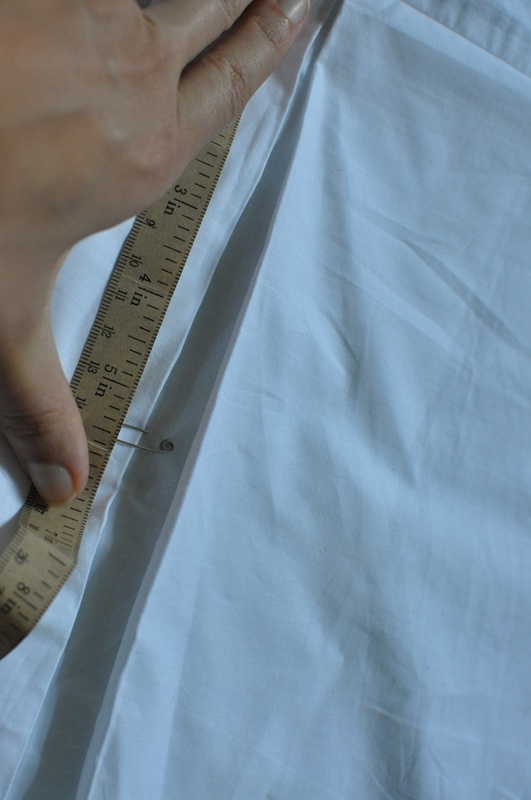 Measure the skirt, from the bottom, and mark how long the skirt should be. My skirt needed a 10″ drop, but the drop was about 16 inches, so we had to get rid of 6 inches. I placed a pin 10″ from the bottom of the skirt (I used safety pins, which are much more cumbersome than straight pins, but important when curious little fingers are lurking). Do the same thing all the way around, marking the desired length. Now’s where things get real. 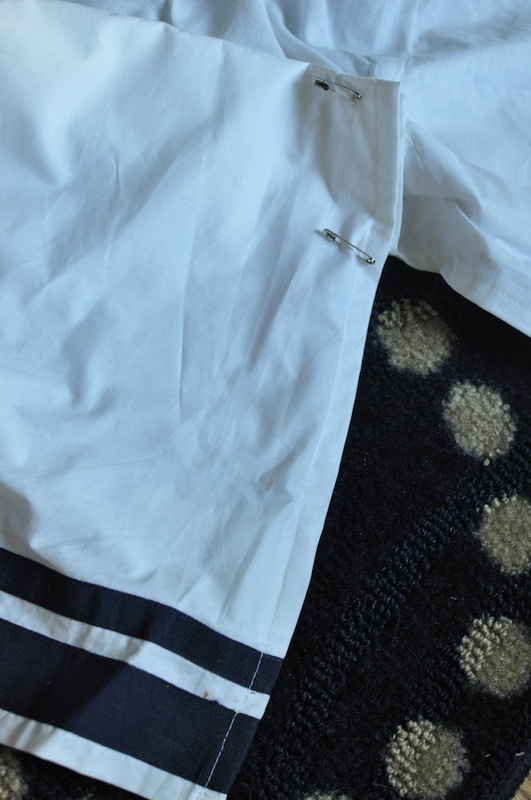 Fold up the fabric, pinning it to the interior part of the skirt. 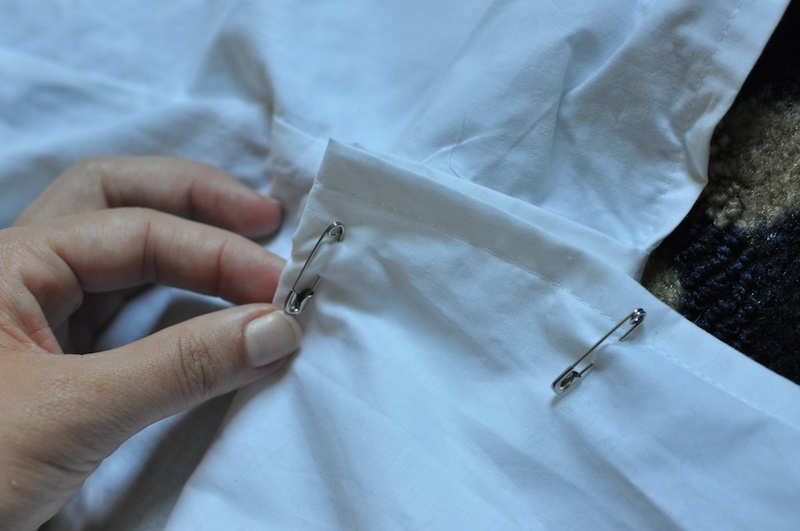 Pin it to the part that will be covered by the mattress, then remove the pin you used as a marker. So, I had 6″ to get rid of. I folded it about 3″ up (which doubled over, makes 6″). Are we following here? Am I over complicating this? Make sense? It’s really easy, and sometimes the easy things are the most complicated to explain. In a writing class I once had to write an essay about how to make a PB&J. We had to keep it to something like 20,000 words and with that limit, most of us only got as far as the part where you get out the bread. Here’s a photo of the crib skirt shortened all the way around. 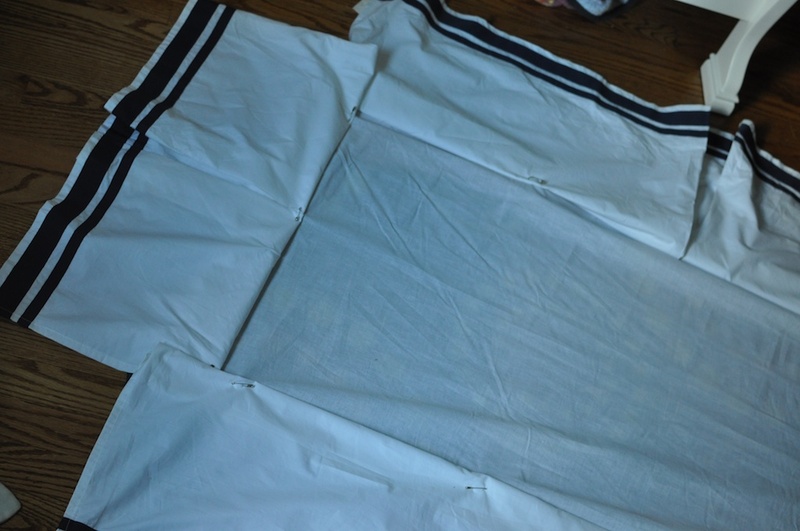 It gets a little weird around the corners, but only because there are multiple layers of fabric to work with. The most important thing is just to make sure your folds are neat and flat. And here’s the final product, back on the mattress platform. It looks so much more tailored and neat. And we don’t have to look for a new place to stash our table leaf. We’re in a similar place this week in the Krieger home. 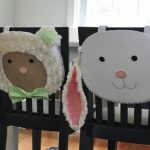 Every day that passes is another day that I can get things accomplished before the baby arrives. I’ve finished Father’s Day shopping, knitting for the baby, and am eating my way through all of our junk food because obviously Tom isn’t going to do it, so someone has to. Last night there was a huge pot in our sink and I asked Tom if he could wash it. He was exhausted and offered to do it in the morning. 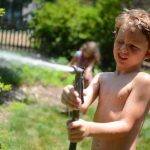 I told him he could do it in the morning, or when I wake him up in the middle of the night to tell him I was in labor; which ever came first. He looked at me and told me he’d do it in the morning. And he was right. 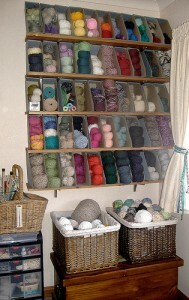 Okay, this might not be nesting, but it IS crafting, which is nearly as bad. I need to get over there with an over stuffed pillow and a pint of ben and jerry’s STAT! I’m surprised David Andrew hasn’t crawled under his bed and discovered your table leaf. Mary Virginia will handle that. the leaves are really heavy — i can barely move them! they aren’t covered, though. we find toys under/in/around them all the time…so he’s definitely discovered them. 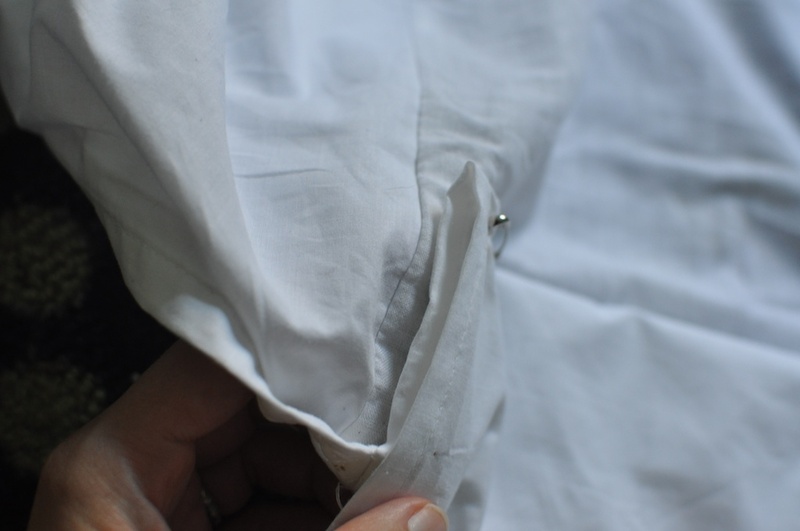 I have needed to do this to a full sized bedskirt forever and have just put off dragging it out and figuring out the right way. 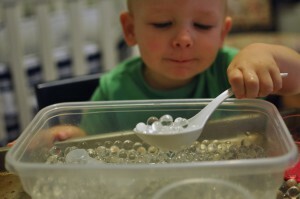 I will do so much better now that I have pictures! 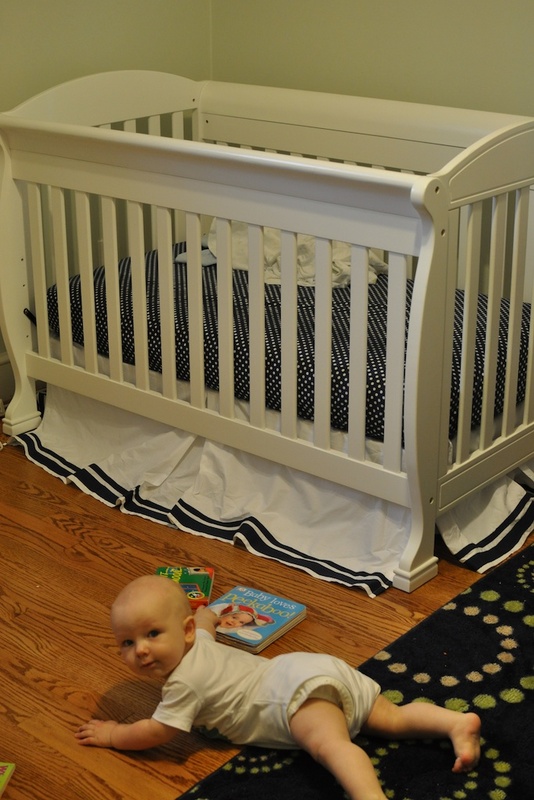 Thank you so much for your post we have the crib skirt and we would have never figured this out without you! Ours looks great now!